Anyone can start a blog and publish posts. But if you want a blog that’s going to generate traffic, boost your leads and email subscribers, and increase your income, you’ve got to blog strategically. What’s one of the best ways to be strategic when writing new posts for your blog? Build your blog posts around the keywords your audience uses when they Google information related to your brand or niche. How do you know what these keywords are and which ones you should integrate into your blog posts? By doing keyword research. Keyword research helps you leverage what your audience is already searching for to drive traffic to your blog. It also ensures that instead of getting just any traffic to your blog, your posts are attracting your ideal visitor or customer. And there’s no denying that targeted traffic is a whole lot better than random traffic. Although keyword research may sound like scary SEO jargon, the basics of keyword research aren’t hard to tackle at all. 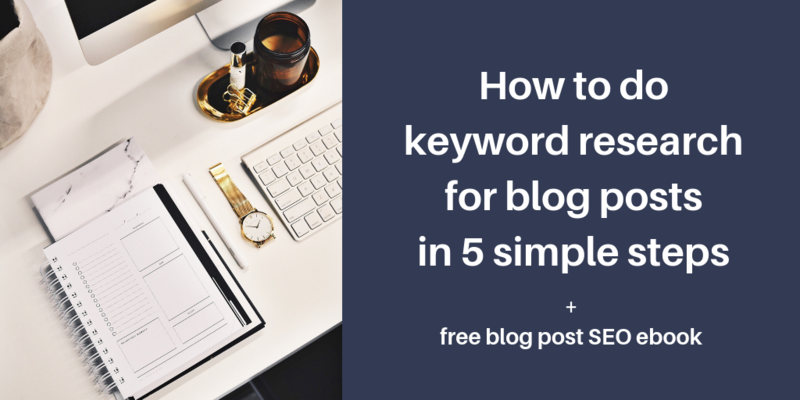 Here’s how to do keyword research for your blog posts in 5 simple steps. Want to create a consistent source of traffic to your blog and make your posts visible to the people who are looking for brands like you? Download my free ebook SEO Basics for Blog Posts. Before you start brainstorming specific keywords, kick off your keyword research by making a list of 5–10 broad topic categories you want to rank for. These should be topic categories that are related to your blog or business and that your target audience would search for on Google and other search engines. If you’ve been blogging for a while, they will probably be the broad thematic categories your posts fall into. What is the format of a blog post? Find out what terms your audience uses when searching for information related to your brand. To do this, look at blog and social media comments, forums, and even customer service emails. Another key component of keyword research involves identifying the keywords your audience currently uses to find your blog or website. To do this, use Google Analytics, Google Search Console, or logs from your website to find out which keywords people are using to find you online and which terms they’re using to search for content on your blog or website. Need help coming up with more keywords your audience might use? Search for one of the keywords on your list in Google and scroll to the bottom of the first page of results. You’ll see a list of search terms that are related to the keyword you searched for. Feel free to add these terms to your list or use them as inspiration to generate other keywords. You can also use Soovle to find out what the top autocompletes for a keyword are on key search engines and websites, including Google, Bing, YouTube, and Wikipedia. Just type a keyword into the box in the middle of the page, hit “Soovle,” and see what comes up. If you start to feel overwhelmed, remember that you aren’t trying to create your final list of keywords in this step. Instead, you’re creating an initial list of keywords that you’ll refine in subsequent steps (phew!). When you do keyword research, it’s important to make sure you have a mix of head terms and long-tail keywords in each topic category. Head terms are generic keywords. They’re typically 1-3 words long and have many blogs and websites that come up as search results. In my “blogging” topic category, “blog” and “blogging” would be examples of head terms. Long-tail keywords, on the other hand, are more specific keywords. They’re typically 3 words or longer and have fewer blogs and websites that come up as search results. In my “blogging” topic category, “best blog post template” and “how to write a blog post title” would be examples of long-tail keywords. When you build a keyword list, it’s important to ensure you have a mix of head terms and long-tail keywords. Why? Because it’ll give you a balance of keywords that will generate smaller but easier wins and larger but more long-term gains. Still confused? Let me break it down for you. Because head terms are more generic, people are more likely to Google them and there are more websites and blogs that rank for them. This popularity usually makes head terms more competitive and harder to rank for than long-tail keywords. However, just because fewer people search for long-tail keywords doesn’t mean that they can’t generate great results for you. In fact, even though head terms may drive more traffic to your blog, long-tail keywords can give you better traffic. Because someone searching for “blogging” is probably casually browsing for information. In comparison, someone who’s looking for the “best blog post template” or “how to write a blog post title” is actively looking for specific information and is probably willing to put in more effort (for example, by signing up for an email list) to get it. As a result, they’re often more likely to convert. And even though individual head terms are more frequently searched than individual long-tail keywords, as a group, head terms make up only 30% of online searches. Long-tail keywords make up the remaining 70%. Ensure your keyword list has a balance of head terms and long-tail keywords. This way, you can start ranking for less competitive terms but also build your SEO juice for more competitive terms over time. You don’t have to copy everything your competitors do. (In fact, you shouldn’t because then you’d be just like them and wouldn’t stand out.) But finding out which keywords your competitors are ranking for can help you build your own keyword list. When you check out your competitors as part of your keyword research, you can assess the overlap between the terms they’re ranking for and the ones you have on your list. If your competitor is ranking for a keyword that’s on your list, it tells you that it may be worth the effort to improve your ranking for that keyword. And if there’s a keyword on your list that your competitor isn’t ranking for, it tells you that you may have an opportunity to rank for a term your competitor hasn’t already conquered. So how do you find out what keywords your competitors are ranking for? Well, you can manually search their blog or website to identify terms they use frequently in their copy. Or you can search various terms in Google and see how far down the results page your competitors are listed. But these methods can be tedious and time consuming. Thankfully, you can use a tool like SEMrush to make the process easier. With SEMrush, you can enter a particular blog or website domain and get a report on the top keywords the domain is ranking for. Although SEMrush is a paid tool, you can sign up to get 10 free reports. At this point in your keyword research process, you probably have a lot of keywords on your list. It’s time to narrow this list down by identifying the keywords that are most important to focus on. There are lots of tools you can use to make this step easier. But one of the popular tools is the Google Adwords Keyword Planner. If there are keywords on your list that have a very low or very high search volume, you may want to reconsider including them. If a keyword isn’t searched much or gets searched thousands of times a day, it may not be the best keyword to focus on. Of course, it’s also important to remember that a keyword’s search volume can change over time. Some keywords may have a low search volume right now. But if this volume has been increasing steadily over time, there’s a chance it could be a lucrative keyword in the future. How can you predict which keywords will be rising stars? Search them in Google Trends. With this tool, you can type in a keyword and see how its popularity has changed over time. To keep track of the keywords that will give you short-term wins vs. long-term gains, create a spreadsheet of your keywords. For each keyword, list its search volume and competition level. This way, when you select a keyword to focus on in each blog post, you can make an informed, strategic decision about which keyword to tackle next. If you’ve never done it before, doing keyword research for your blog posts may seem daunting. But the reality is that basic keyword research isn’t hard at all. Sure, it may take some time to do. But in the end, you’ll end up with a solid foundation for writing strategic blog posts that get you more traffic, subscribers, and sales. 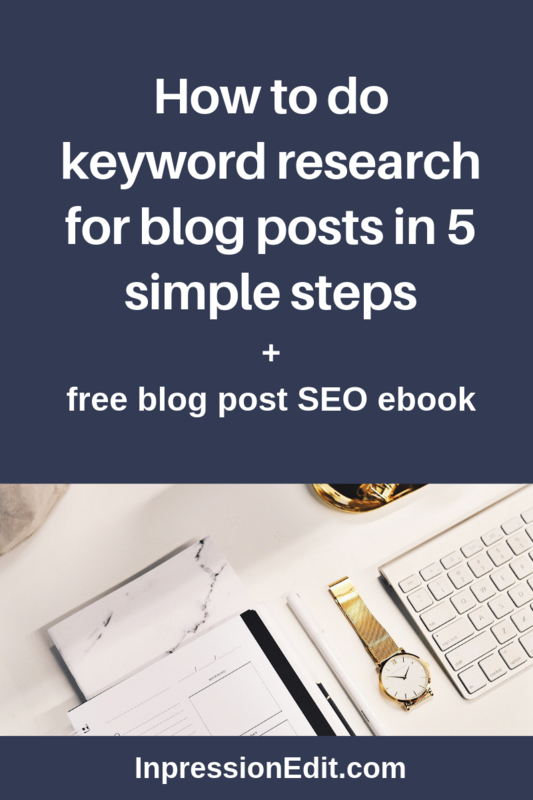 Learn how to use your keywords to create SEO-friendly blog posts that match what your audience is searching for online. Download my free SEO for Blog Posts ebook.